US$ 810 / person ? 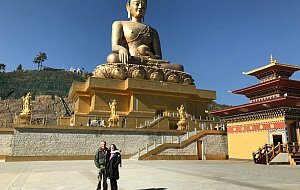 1 Arrival, drive to Thimphu Arrival by plane to Paro airport and drive to Thimphu or in case of arrival by land, crossing border from India in Phuntsholing/Jaigon and full day drive to Thimphu. Stop at Tachog lhakhang to see traditional bridge made using ancient iron chains. Depending on arrival time visit of Tashicho dzong, the castle, which serves as seat of the king and government. If time permits, visit of the other sights. Early morning drive to Buddha Dordenma, the gigantic statue of Buddha overlooking the valley and walk to striking city viewpoint. See Memorial Chorten, always busy with devotees. Walk in Norzin lam street and see the traffic police signaling in junctions. Thimphu is only capital in the world without the traffic lights. Finish walk at handicraft market where many interesting Bhutanese souvenirs can be seen and bought for reasonable price. Visit hand paper factory a Thangkha painting centre, where young artists learns the skills of their forefathers. After that drive to Changankha lhakhang, the oldest place of worship in the valley. Transfer to Wangdue or Punakha over Dochu-la pass (3010 m) with visit of royal temple Druk Wangyel lhakhang. 3 Wangdue/Punakha – Paro Morning climb to Khamsum monastery with wonderful view of the valley and it‘s terraced paddy fields. See the longest suspension bridge in Bhutan stretching the length of 350m over Pho Chhu river. 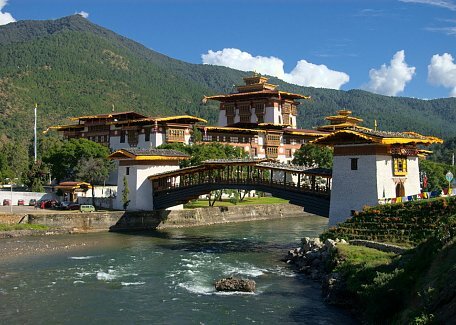 Visit of Punakha dzong, which counts as the most intricately decorated castle in the kingdom. Short walk to Chhimmy lhakhang temple, devoted to 15th century saint Drukpa Kunley, know as “Divine madman”, who did taught Buddhism by singing, drinking and rampant sexual behavior. If time permits, also visit Sangchhen Dorji Lhuendrup Lhakhang nunnery with Bhutanese and Nepali style stupa, overlooking the valley from the high hill. Afternoon drive to Paro. 4 Paro Visit of the National Museum and Paro dzong (Rinpung dzong), the castle-monastery where Bernardo Bertolucci’s Little Buddha film was shot. The pristine Kyichu lhakhang is one of the two oldest temples built in Bhutan. Climb to Taktsang gomba (Tiger’s Nest), is the highlight of the tour. While the hike seems to be hard, it’s very rewarding. If you don’t feel so strong, you can climb just halfway to cafeteria with nice view of the place. You can consider hiking in the morning or early afternoon depending on weather, your fitness and preferences. 5 Departure If time permits, you can make visit to Drukyel dzong, the castle ruins from where you can see the summit of holy Jomolhari mountain in clear weather. After that you depart from Paro by flight or take 6 hours drive to land border in Phuntsholing. Haa valley homestay (+2 nights): At the end of the tour, you can drive over the Chele-la pass (nearly four thousands meter high) to rarely visited Haa valley. On the way you can do hike to Kila gompa, oldest nunnery in Bhutan from 14th century and also experience high altitude on the ridge of the pass from where Mt. Jomolhari and Kanchenjunga can be seen in clear weather. In Haa you'll stay in three hundred years old farmhouse as a guest of local family. Haa is less visited valley due to the fact, it's home to Indian military base. Anyway the nature is very pristine and so are the villages. You can visit few local temples and also make nice village hike around.